I did it! 500 miles. Yes Five Hundred Miles. Or, if you prefer….804kms. That’s right, Eight Hundred and Four kilometres. Put that in your pipe and smoke it P.E. teachers from my youth! And I did it all in just under 18 months. I’m pretty chuffed with that. 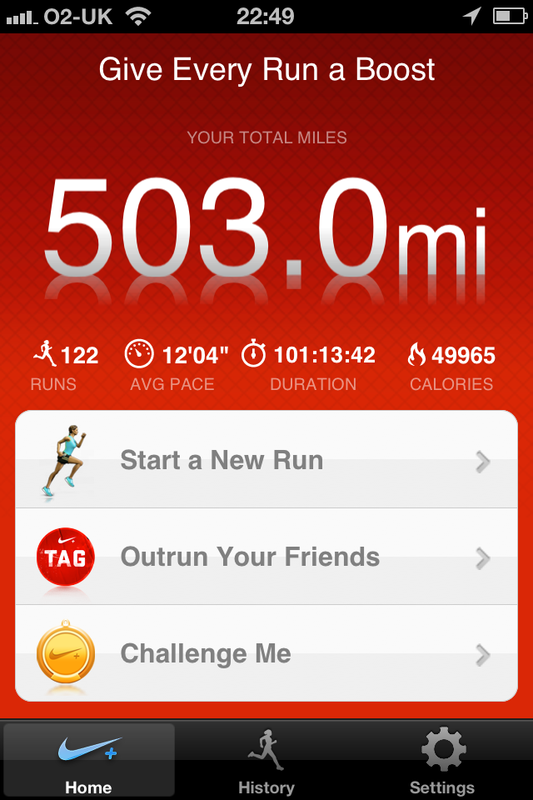 Plus, according to the glorious Nike, I burned a smoking 50,000 calories. That’s at least one of Rory’s caramel and macadamia nut cheesecakes. Result. Never to let a celebratory moment pass without some kind of fantastic reward, I have bought myself some shiny new trainers to carry me through the British 10K, the Palma Half Marathon, and should the ballot gods look kindly upon me (or not as the case may be), maybe even the big daddy, London Marathon 2013…. YES I registered. Now holding thumbs for the announcement in October. Finally back in training having secured a place in the British 10K and another in the Palma Mallorca half marathon in October and I’m determined to get sub 1hr on the 10K and sub 2:15 on the half. 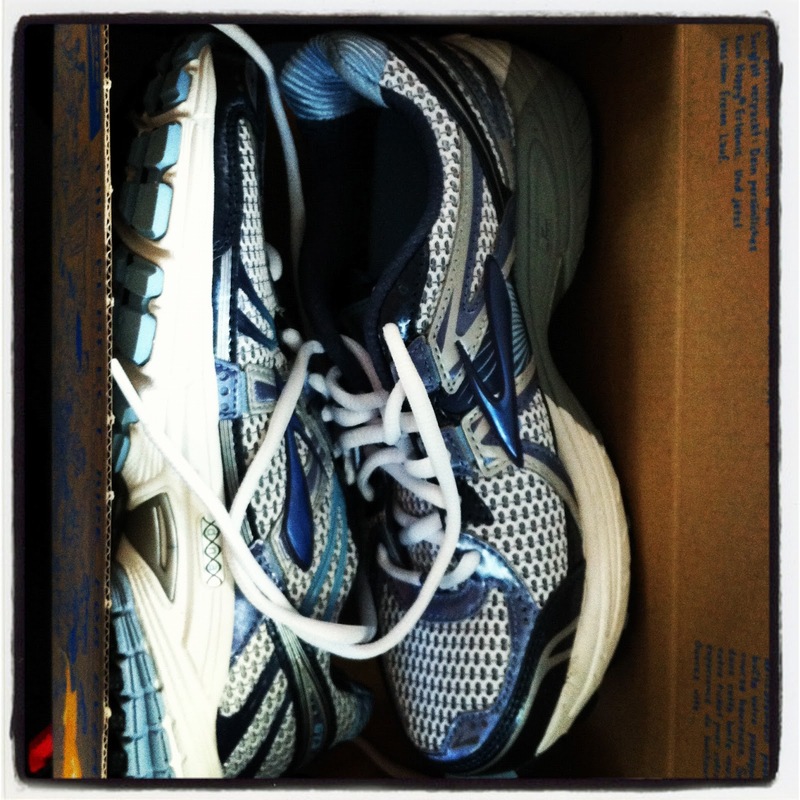 I need to hit the intervals and get faster, which ultimately means changing up the routine. 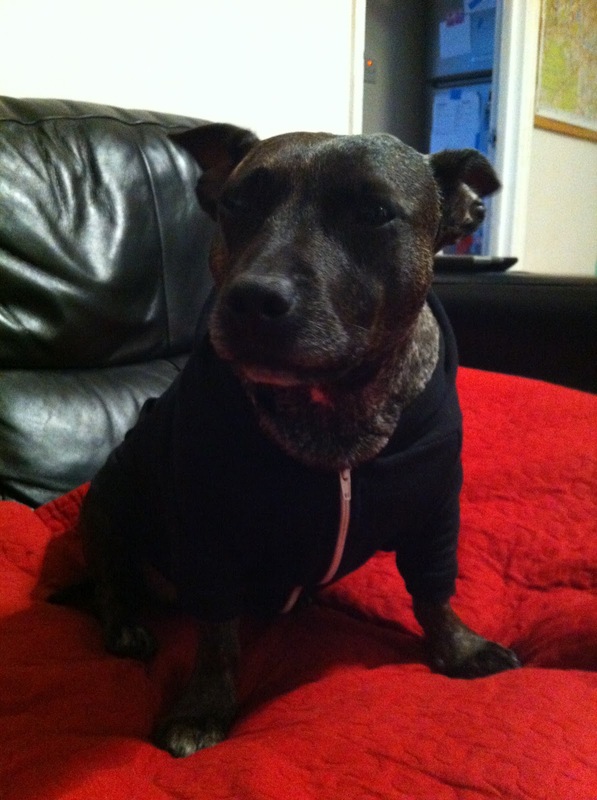 So I dressed the dog up in a very fetching American Apparel hoodie to get her ready for the new regime. 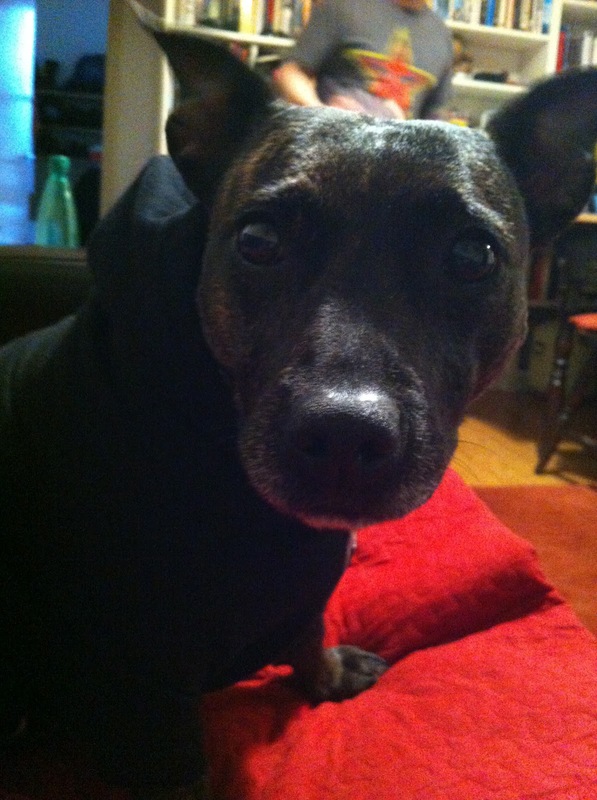 She has since figured out how to take it off so there goes our co-ordinated running team look. Today I managed a speedy 5K fuelled by my angry 15 year old self. I have since rediscovered the music of my misspent youth (maybe something to do with another birthday on the horizon and getting a little further into my 30s? That or I had amazing taste in music 16 years ago….). Cue anthems from Pearl Jam, The Offspring, Nirvana, Soundgarden and RATM. Had you told me 16 years ago, (probably in detention though a haze of B&H special mild), that years from now I would be listening to the exact same soundtrack while pounding the pavements in London (in Lycra no less) I’d probably have given you the finger (perfectly manicured with black permanent marker of course) and told you to stop smoking your socks. Ironic then, that in 2012 I’m picking up the pace to ‘Smash’ and sprinting down the last 1K to ‘Genocide’. I’m now pulling together an even more grunge worthy playlist to sort out my next long run. 10K of Temple of the Dog and I may revert to wearing my ripped jeans and bleach dyed vests. 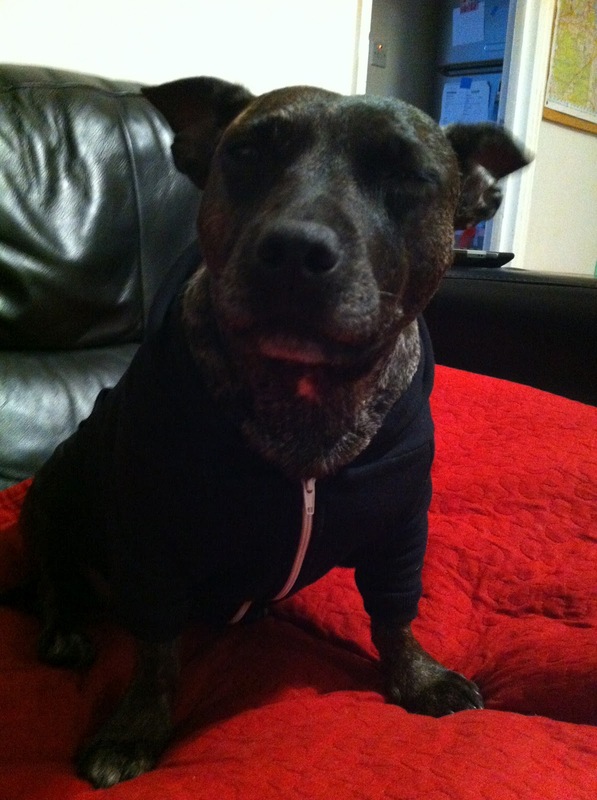 The music itself may have to remain on the iPhone though, R is having none of it. While sorting out my playlist earlier today he said ‘I think I’ve heard enough of this, what is it exactly?’. Talking ’bout my generation…. Curator. Compiler. Contributor. Visualiser. Verbalist. Ventriloquist. Fuelled by the power of cake. How she makes her beer money.